Zip up that bubble jacket and get your hoverboard ready: The world's first time machine might already be in operation. 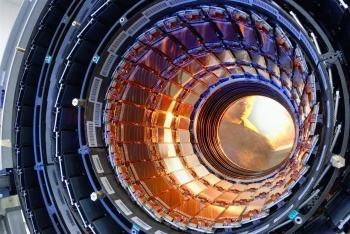 A new theory from physics experts Tom Weiler and Chui Man Ho of Vanderbilt University says that the Large Hadron Collider, the biggest atom smasher in the world, could also be a time machine. If the LHC is able to discover the elusive Higgs boson particle, which supposedly determines how objects acquire mass, the theory predicts that it'll also discover a time-traveling particle called the Higgs singlet. The Higgs singlet might be able to travel forward and backward through time by jumping to a 5th dimension. Sadly, even with the LHC humans probably won't be able to travel to the past or future along with the Higgs singlet, but Weiler says we could potentially send messages. A Vanderbilt press release says that if researchers monitoring the LHC discover Higgs singlet particles that appear simultaneously with their decay products, Weiler and Ho believe that they "will have been produced by particles that travel back in time to appear before the collisions that produced them." This becomes possible because while the basic elements of the universe are stuck to a theoretical four-dimensional membrane called the "bulk," and therefore cannot travel to other dimensions, particles like the Higgs singlet are not. Weiler describes the theory as a "long shot," but believes it's possible because it doesn't violate any laws of physics and "avoids all the big paradoxes." While humanity may never get an actual time machine, just having a time "mailbox" might not be so bad, as long as we can keep it free of spam.